Point-1). 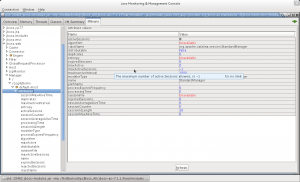 Accessing MBeans using the JBoss Remoting Port 4447 on JBoss AS7.1.1.Final. In our previos demo (http://middlewaremagic.com/jboss/?p=1846) JMX code we used Native management Port 9999 in order to access the MBeans remotely. Now we will use 4447 port to do the same. Here If the value of “use-management-endpoint” is “false” then this connector will use the remoting port 4447 for the jmx operations. Point-3). 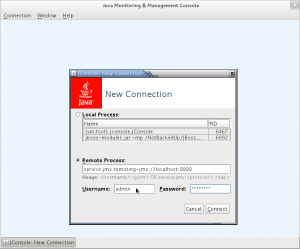 Connecting to JBoss AS7 using JConsole Remotely. Point-4). Connecting to JBoss AS7 using VisualVM Remotely. Here wec can see that you can start JBossAS7 in a particular Bind address as well. “-b” option can be used to define the Public Interface bind address, where as “-bmanagement” is used to assign a same or different Bind Address for the Management Interface. To maintain security of your Management Interaface you can run it in a secured Host address or in localhost using -bmanagement. ***NOTE***: In the above program we are trying to access various attributes present inside the ObjectName “jboss.web:type=Manager,path=/Log4jDemo,host=default-host” where “Log4jDemo” is the Context-Root of My WebApplication which i wanted to monitor. And th edefault Host-Name is “default-host”, In your case these values might be different so better use the JConsole to connect to JBoss Locally and then get the exact Object name from it. ***NOTE***: It is must that your JMX Client should include the “jboss-client.jar” in it’s classpath as above. 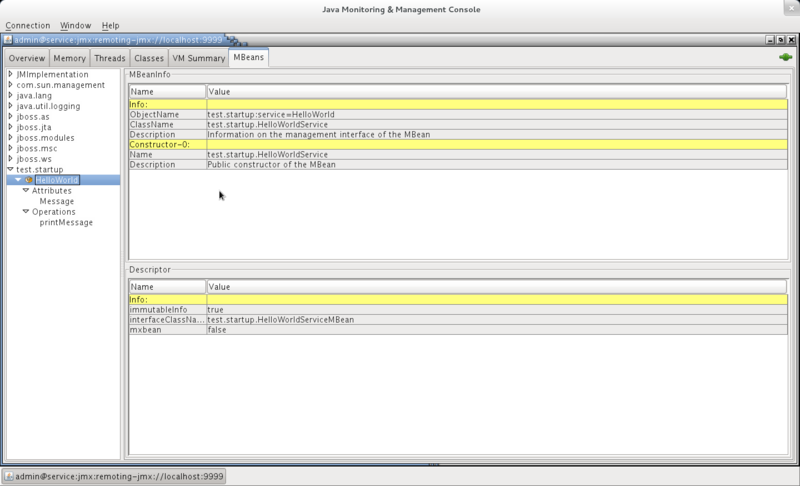 If you want to start your JConsole in order to connect to JBoss remotely then you should use the “jboss-as-7.1.1.Final/bin/jconsole.sh” script provided by JBoss, which does additional classpath settings which is required in order to use the JBoss implementation of the mbeans. The port can be decided based on the Point-2). mentioned above. There is a good script developed by “Mr. John O’Hara” as mentioned in the community link: https://community.jboss.org/thread/196428 Which can be used to connect to JBoss using VisualVM. echo "WARNING JBOSS_HOME may be pointing to a different installation - unpredictable results may occur." MODULES="org/jboss/remoting3/remoting-jmx org/jboss/remoting3 org/jboss/logging org/jboss/xnio org/jboss/xnio/nio org/jboss/sasl org/jboss/marshalling org/jboss/marshalling/river"
Point-1). Listing and Expiring all the HttpSessions related to a particular WebApplication using JMX. Point-2). 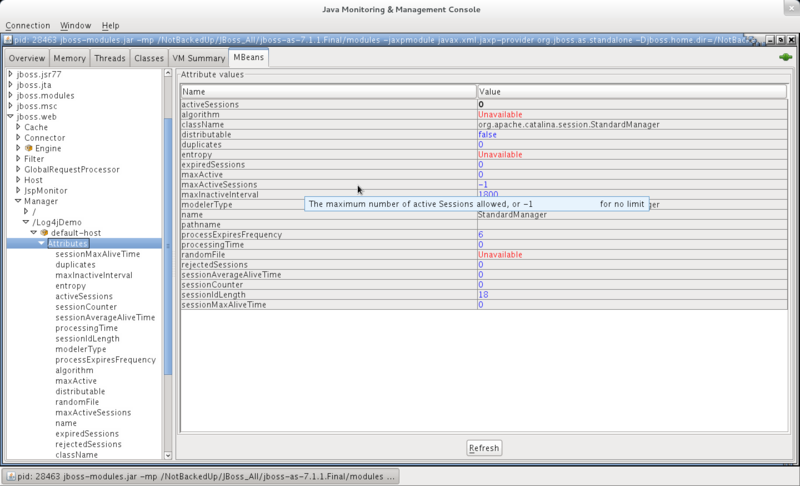 Accessing MBeans using the JBoss Native Management port 9999 on JBoss AS7.1.1.Final. Here If the value of “use-management-endpoint” is “true” then this connector will use the management endpoint, otherwise it will use the remoting subsystem endpoint. Point-4). Here we will also need to make sure that we enable the following System Property in the JBoss Cofiguration file (standalone*.xml) So that JBoss will make the “jboss.web:type=Manager” access available for the remote JMX Clients. You can also start it in a particular Bind address as well. // Following methd can be used to list all the HttpSessions associated with a particular web application. //Following  method can be used to expire a Specific HttpSession associated with a particular Web Application. It requires that you should already have the JSESSIONID of the HttpSession which you want to expire. // Call the following  method by passing a Specific HttpSession ID to expire it.